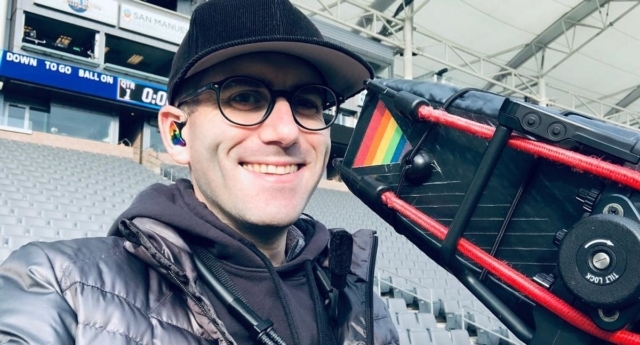 The Super Bowl is set to be filmed by an openly gay cameraman for the first time on Sunday (February 3). Scott Winer, 34, will be shooting the big game between the New England Patriots and Los Angeles Rams for CBS Sports in his home state of Atlanta. He told LGBT sports site Outsports that working at the climax of the American football season was a dream come true. Winer explained that growing up openly gay in Atlanta made it hard to imagine that he would one day achieve this aim—especially at his local Mercedes-Benz Stadium. He said: “When I came out in high school, it was a difficult time for me personally. The people he’s surrounded with nowadays are much more accepting, he said. “I don’t think I ever could have imagined working in an environment where there is such love and support from people I work with, from such a range of ages and experience levels,” explained Winer. Winer said he enjoys visibly representing the LGBT+ community at games—he wears rainbow shoes and affixes a triangle rainbow sticker to his camera to get the message across. Winer first worked as a sports cameraman as a pre-teen in sixth grade, and now films games in the National Football League, Major League Baseball, National Hockey League and National Basketball Association. He put his success down to the “very generous and talented people” who had helped develop his talents, and Winer’s director and mentor Bob Fishman returned the compliment. “He listens and he understands what’s going on in the broadcast,” Fishman said.